It has been an interesting two years and they have flown by quickly, due in large part to the charms of our temporary hometown, Ankara. For an international capital, Ankara can seem quaint and bucolic; the word provincial may even come to mind. But that’s not a bad thing. On the contrary, there’s plenty of fun to be found if you’re patient and keep an open mind. Here are some highlights of our stay. Lojman Livin’ – Being up on a hill, away from the bustle of Ankara proper, does have its advantages. 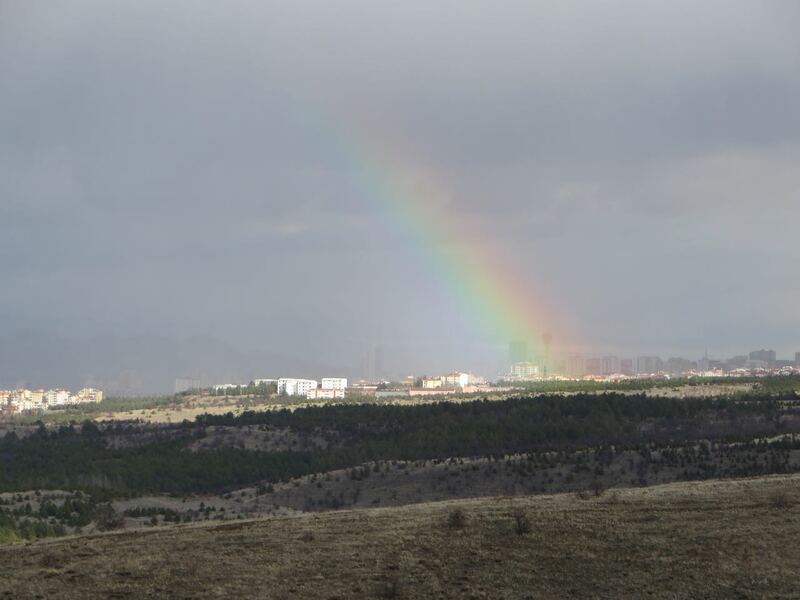 The view is consistently spectacular – we’ve watched many a storm roll in and enjoyed the rainbows (double, and triple!) afterwards, and waking up to the sun in the window has been a treat every morning. Bilkent has made the grounds very attractive, with plenty of flowers always in bloom and a constant variety of fruiting trees – spring has been a festival of scents and colors. So while we may complain a bit about being isolated in a ‘foreigner bubble’ away from the sounds of ‘real Turkey,’ overall we’ve been happy with our home away from home. Ulus – This is the historic center of Ankara, the place where it all began. You can wander here every weekend and never see it all. The Romans were here back in the day, building temples and roads. Later civilizations would add and rebuild until today. Here you can visit an ancient castle, shop in a covered food pazaar, haggle over carpets, buy artisan jewelry, and watch craftsmen work in the metal district. Relax with a plate of the best manti in town, and before you know it you’ve had a great afternoon on the town. Hiking trips – Nadide Yildiz arranges some great trips. Some of them are just hiking off in a small town or wilderness reserve. Others are culturaly specific. 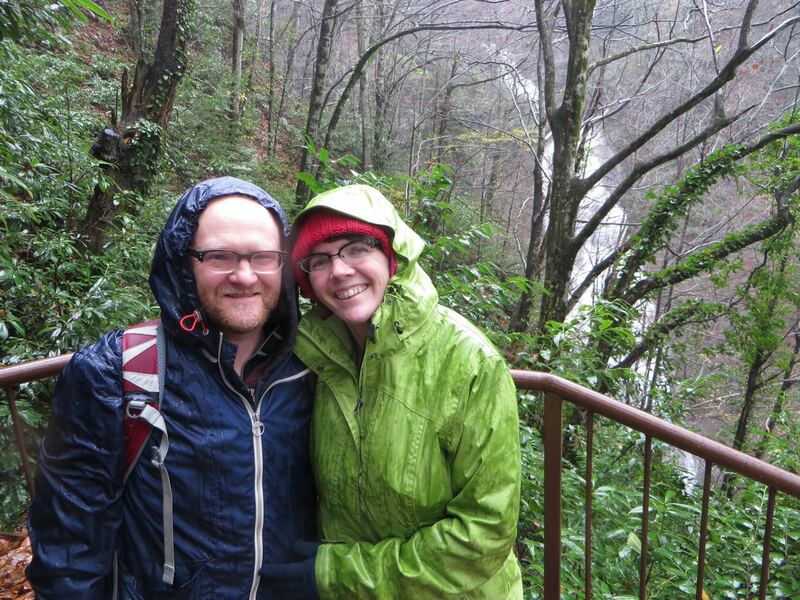 We saw waterfalls, communed with trees and shrubs, and met great new friends. Either way, Nadide is a great hostess. Great little restaurants on side streets – If you push out and explore you can find some great restaurants. Our favorite is a little fish place tucked between the Kizilay and Tunuli neighborhoods. It’s called Yesil Cam, named for the movie-making district of old Istanbul. Here the chef grills the fish on the street, and traditional mezes from tomato salad to lamb’s brains are brought to the table on a huge tray. The atmosphere is old Turkey. Musicians serenade you tableside with traditional Turkish folk music. If you’re there on the right magic night, you’ll see the patrons get up and dance on the sidewalk, shaking off the years with the help of the music and more than a little Raki. Akasha left a trail of her favorites on trip advisor if you want to try some restaurants off the main streets. The Pazaars – foods, fleas, and anything you could want. 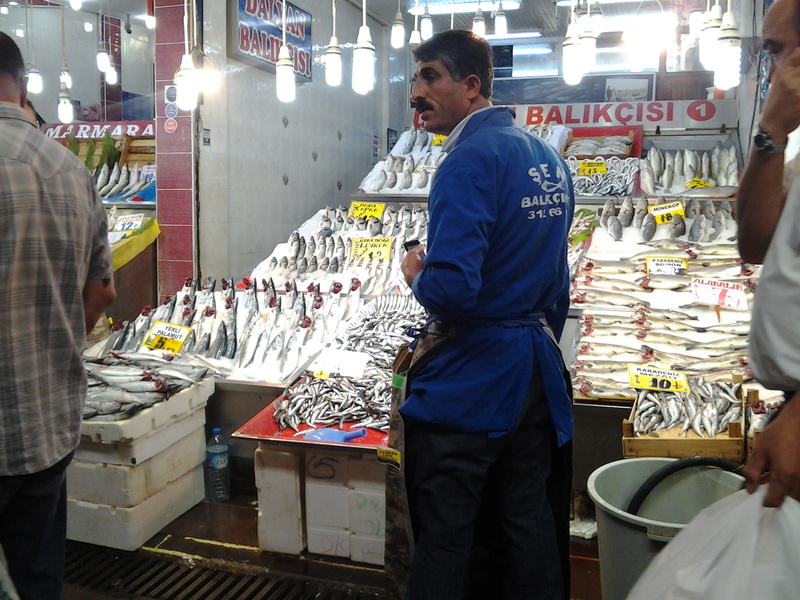 We’ve been to the big food markets at Yuz Yil, Umitkoy, and many other locations in Ankara. Once a month an antique mall sets up in one of several rotating marketplaces, and you can sift through remnants of Turkey’s cultural history – comic books, movie posters, costume jewelry, vintage clothing, old tin toys – anything and everything. It’s like a pop-up museum, and everything’s for sale. Game Cafes – scrabble, chess, backgammon, just not a lot of cards. You can play games, drink a cold beer or a hot nescafe, and play games all night long. If you are feeling like a super dork, try playing english scrabble with Turkish letter distributions. Even without Q’s, it’s not easy – you get way too many vowels, especially u’s. 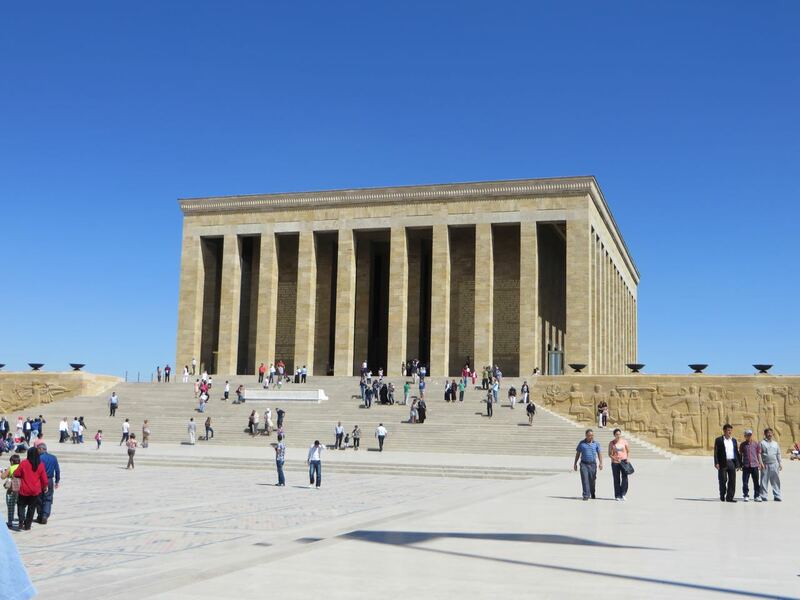 The Anitkabir – This is a monument to the founder of modern Turkey, Mustafa Kemal Ataturk. He saved Turkey from being divided up by western powers after WWI, and laid the foundations for the Turkey that we know today. His picture remains a fixture in every office, restaurant, shop, and classroom in the country. This complex of polished stone and granite columns features a museum of his life, a history of his military exploits, and his final resting place. A proud, somber site, one of the few must-see attractions of the city he made the capital. Finding not-Turkish food – Because Ankara really doesn’t have a lot of food that isn’t Turkish. And because Ankara has a big mall culture, with lots of the same chain restaraunts, when you find a unique restaurant it is really exciting. Some of our favorites have been Big Bang Burger, Wu Yang, and Cafe Linz. Wu Yang is an east Asian restaurant with Chinese and Korean food. it can be great, if your order right. I love the house made spicy tofu. It is similar to Sundubu with fluffy clouds of tofu in a spicy sauce. Order a side of rice and kimchi to put yourself in Korea for the evening. Definitely show up with a group of 6-8 to get the circular table, order a variety of dishes, and share family style. Cafe Linz has delicious desserts like a house made chocolate souffle and sachre torte. Street Dogs – Ankara has them. So does Istanbul and Izmir. Everywhere in Turkey are street dogs. For the most part they’re friendly, well-behaved, and cute, prefering to spend time napping in public squares to begging for snacks. They make for great local color. Several friends adopted them for house pets, and for a sweet friendly dog you couldn’t do better. We could go on: Cheap taxis, friendly faces, simit carts, dondurma (ice cream), doner shops, walks in the wilderness, endless shopping caverns, crafting supplies, Ankara has it all, and with its own flair. But it’s time to move on. Thank you Ankara for your hospitality. 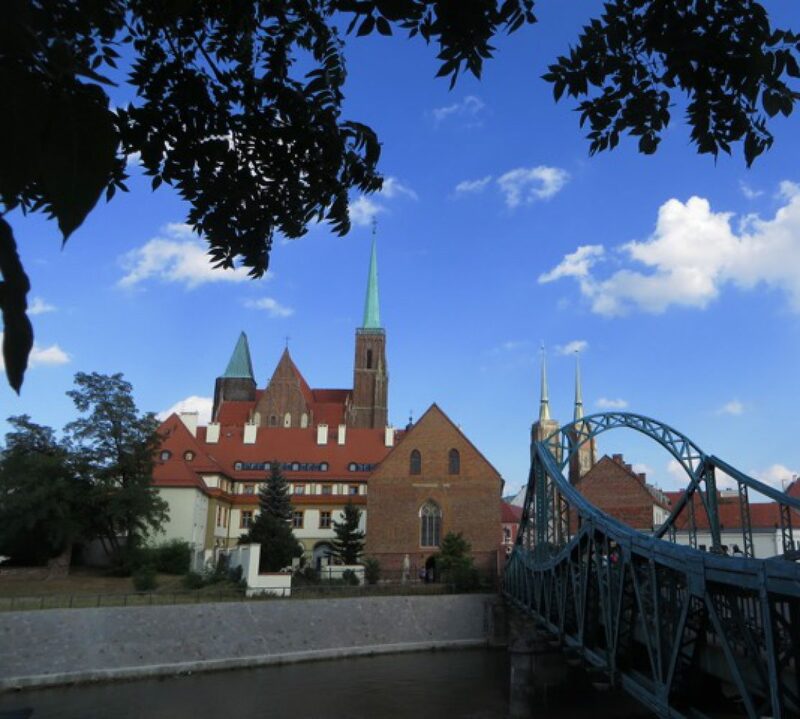 Now, we’re heading to Wroclaw, Poland next, as you probably know. We are going to continue blogging on this site, and plan to do so more frequently. Thank you for reading, we’re happy you’ve joined us on the web or on the road. Remember: Adventure is out there!